Oh the many stories we have of traveling with professional wedding photography gear! In January of 2009, Jeff and I landed in Venice, Italy, to photograph a bride and groom. This was our first international trip where we were actually PAID to travel for a shoot, and we were SO EXCITED. So Jeff and I did our due diligence, and we bought a brand new rolling camera bag to carry our photography gear (I’ll leave the company unnamed as this was NOT a good experience). As we left the airport and boarded a water taxi to take us into Venice, Jeff lifted our new camera bag onto the boat and the long rolling handle SNAPPED OFF. Except for the two tiny bolts at the very bottom of the bag, the handle DETACHED off the back of the bag, and we were seriously lucky that we didn’t drop the whole thing in the water and lose ALL of our gear! When we got dropped off in Venice, we couldn’t roll our bag to our hotel because of the broken handle, so Jeff had to carry the 60 pound load through the winding cobblestones streets ON HIS BACK. To make matters worse, we had three more weeks of traveling all over Italy and we had to wrap duct tape around the bag to keep the handle on every time we wanted to move it. If that wasn’t enough, when we boarded our plane in Rome to come back home, Jeff lifted the duct-taped bag into the overhead bin and the SIDE handle snapped off!! Poor Jeff nearly dropped our 60 pound camera bag on a passenger’s head! As you can imagine, that awful first experience taught us exactly what we needed - and didn't need - when traveling with professional wedding photography gear. Since that first trip to Venice, we’ve flown nearly 500,000 miles all over the world traveling with our professional wedding photography gear in tow, shooting at least half of our weddings outside of Southern California (we shoot 20 weddings every year and for many years very few of them were in San Diego). In fact, we've taken our full gear set to Singapore, Australia, El Salvador, Peru, Guatemala, Mexico, Bolivia, France, Italy (several times), Nicaragua (twice), and all over the U.S (countless times). Friends, we're frequent flyers, and it's rare that we get on an airplane without our gear, so we’ve seriously refined our travel system. So check out how we roll when we’re traveling with professional wedding photography gear - including our favorite rolling camera bag EVER! We bought version 1 of the ThinkTank Airport Security rolling bag in 2009 right after we got home from that fateful trip to Venice. That single bag was with us for nearly the entire lifetime of The Youngrens - until we replaced it in 2018 with version 3. Through every wedding - from a five star ballroom to a hay field to a city street - it’s had our backs! I’m serious my friends. This bag lasted us TEN YEARS of shooting and traveling around the world. I'll never use a different one! The biggest issue with our first awful bag experience was the handles - they were bolted into the sides of the bag so they couldn’t handle the sheer weight of the gear inside. ThinkTank bags have the handles sown into the very fabric of the bag, so the heavy weight is distributed when it’s picked up. 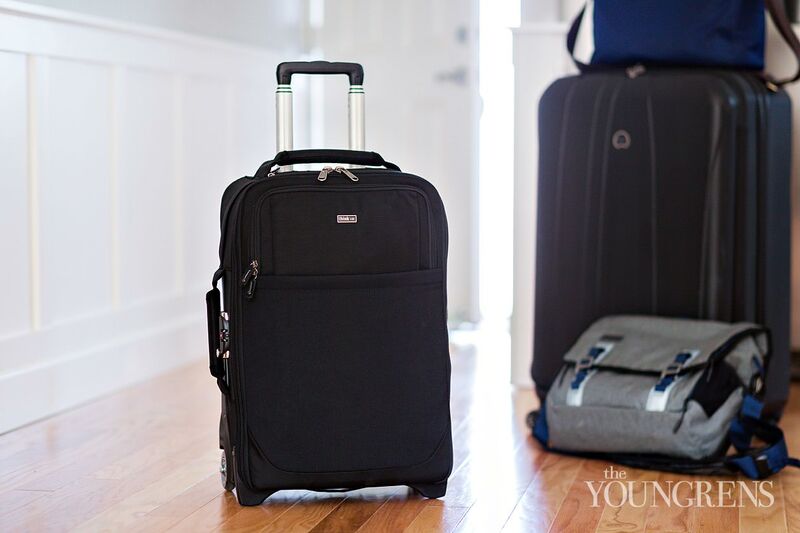 When we have to pick up our 60-80 pound roller bag and load it into an overhead bin, onto a train, into the trunk of a cab or up a flight of stairs, there’s no question that it will hold together. We have the ThinkTank Airport Security version, which fits plenty of gear for two people. If you’re a married team, this is your bag my friend. However, many of our solo photographer friends that love traveling with professional wedding photography gear have the ThinkTank Airport International, which is a slightly smaller version of our bag. This is perfect for individual shooters and easily fits in any overhead bin you could possibly imagine. The Airport Security bag will fit into the overhead bin of nearly any aircraft we’ve been on except for smaller jets like the CRJ900. BUT this bag will fit UNDERNEATH the seat in front of you on those smaller aircraft!! When we discovered this, the #roadwarrior skies parted for us, because flight attendants would always take one look at our bag on those small airplanes and ask us to check it (which we never would - we had to beg to put it in the closet). But now we can just let them know that it will slide beneath our seat! From what our friends tell us, the Airport International usually fits in those overhead bins on the CRJ900, but it will also easily fit underneath the seat in front of you if you find yourself on a smaller jet. Ok, so we have a rolling bag for traveling with professional wedding photography gear, but you might be wondering how we actually carry our gear around while we're shooting a wedding? We use ThinkTank Retrospective shoulder bags when we're shooting on location. I love the size of the Retrospective 10 (its not too big for my small female frame) and Jeff uses the Retrospective 30. 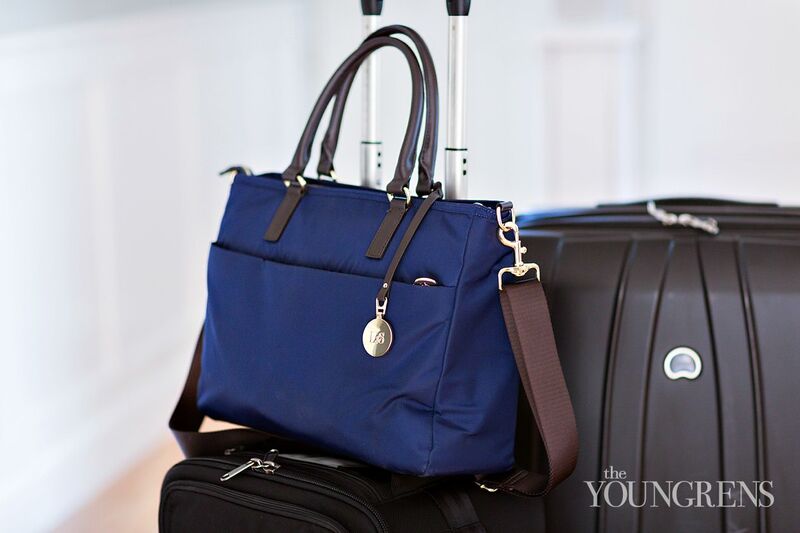 When we're flying, we pack our empty shoulder bags into our personal suitcase that gets checked (no gear inside our suitcase, all gear fits into the carry-on rolling bag). The only items that come onto the plane with us are the rolling camera bag and our laptop bags. Jeff and I consider ourselves business travelers, and in talking with other photographers, I find that it’s tough for a lot of folks to legitimize their travels and treat them like a BUSINESS. Understand that you are a company that requires company treatment, and start taking advantage of the benefits that airlines offer. If you’re hoping to travel for your shoots, then commit to ONE airline to gain status as quickly as possible. Since your carry on is your photography gear plus laptop, you will need to check a bag or two, especially if you're a solo traveler. Status will get you this for free. You will need your status to avoid travel disasters and get to your weddings on time. Even though Jeff and I are two people, most of the time, we still need to check at least one bag, if not more, depending on the trip. So especially if you're a solo photographer traveling with professional wedding photography gear, you either need to fly an airline that offers free checked bags or sign up for a mileage program or credit card. 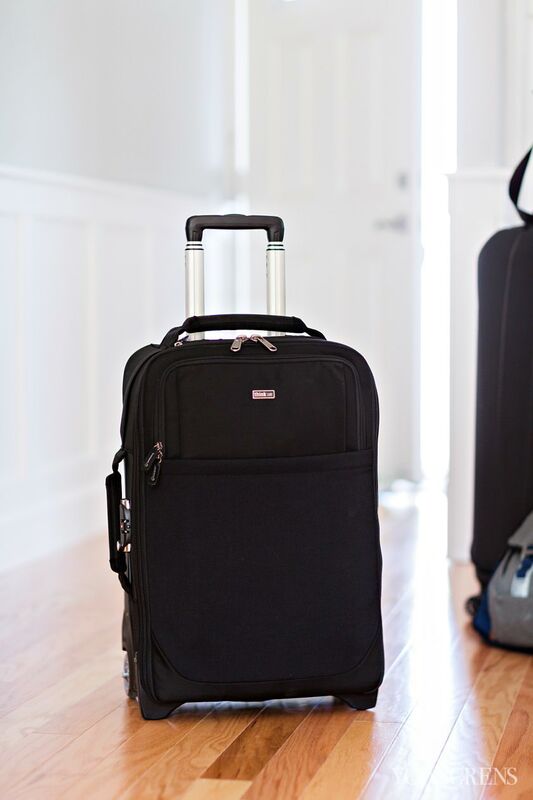 This will get your checked luggage free since it's really difficult to carry everything on and not skimp on your gear, your backup system, or both. When Jeff and I decided that travel was something we wanted to do in our business, we committed to flying Delta immediately. Because we only fly one airline 95% of the time, and we use Delta credit cards and bonuses for business, we earned status on Delta within one year of flying, and have kept it ever since. We get three free checked bags each, first class upgrades, bonus miles, priority boarding, Sky Club access (think: free internet, free food, and showers on layovers) and other important perks that are a HUGE help when it comes to flying for business. Due to our status, when a flight gets cancelled or delayed, we are the first ones to make it onto the next flight. We've avoided countless travel disasters in getting to weddings on time. 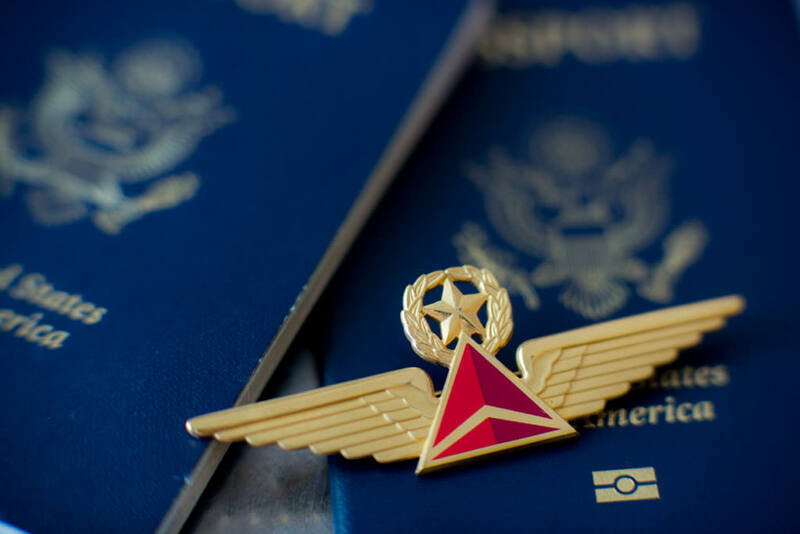 We wholeheartedly recommend Delta over all of the others - they have the best frequent flyer program, for sure! So treat your travels as BUSINESS travels. Take advantage of airline benefits right away and don't jump around! 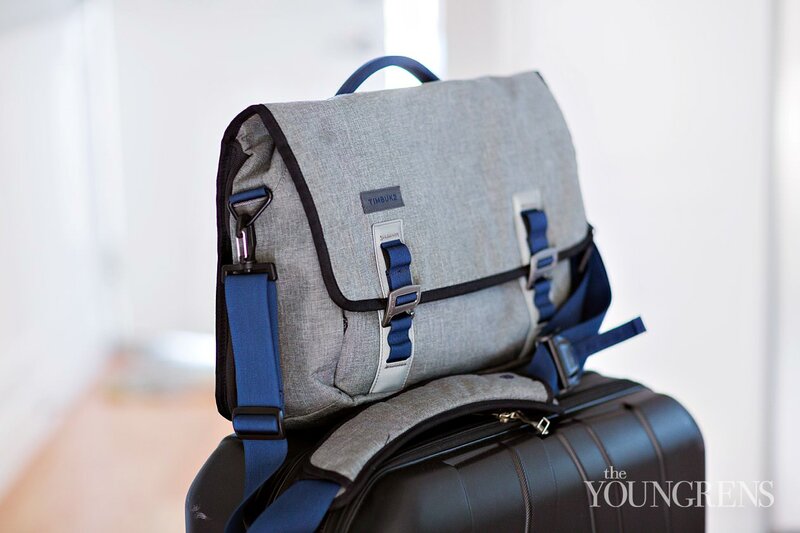 In 2015, my old laptop bag finally fell apart from years of wear and tear, so I spent six months researching a new one, and I immediately fell in love with the one I chose! 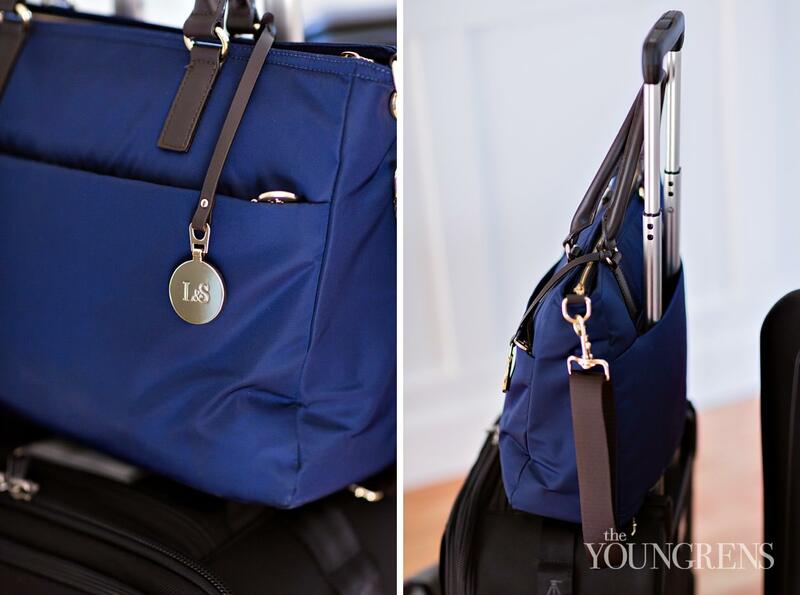 My laptop bag is the Brookline Tote from Lo & Sons and the quality, style, and durability couldn’t be better! My Lo & Sons bag has been all over the U.S. and world including Chicago, New York, Massachusetts, Atlanta, Denver, Las Vegas, Rhode Island, Maine, San Francisco, Italy, Bolivia, and Peru. The best part of my laptop bag?? I've been carting it around the world since 2015 and it still looks like it’s new! It’s stylish and functional, but it’s also held up against the insane amount of wear and tear that I put it through on a daily basis. For Jeff, he loves his Timbuk2 messenger bag, which is a distinctly masculine brand. Jeff raves about it! I tried to find a feminine version of his bag that would work for my laptop, but I really couldn’t find anything. This is a great option for guys. When you’re traveling with professional wedding photography gear, you need to have a mobile backup system for your images that is reliable and simple. 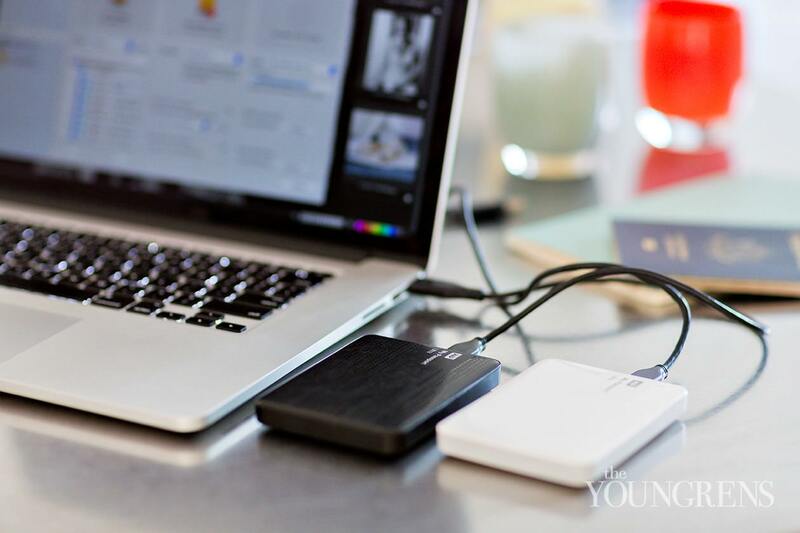 This is so that you can create multiple copies of your shoots on the fly and not worry about losing images during your travels. Because we shoot to two cards simultaneously during a wedding, this means that we have FOUR copies of the wedding by the next morning - two hard drives + two sets of cards. Four copies might sound like overkill, but duplication is key. We've been traveling for weddings for 10 years, and we've never lost an image! Once everything is downloaded, we always keep the two hard drives of the wedding on our bodies (we carry them separately in our two laptop bags the entire way home). Then, we keep one set of cards in our carry-on roller ThinkTank bag, and then the other set of cards goes in our checked luggage. If we wanted to add an additional layer of protection, we have also been known to Fedex the Mobile Backup hard drive home - particularly if we’re extending our travels for a longer period of time. BUT we’ve lost backup hard drives in the mail before, so we’re not as keen on shipping them. 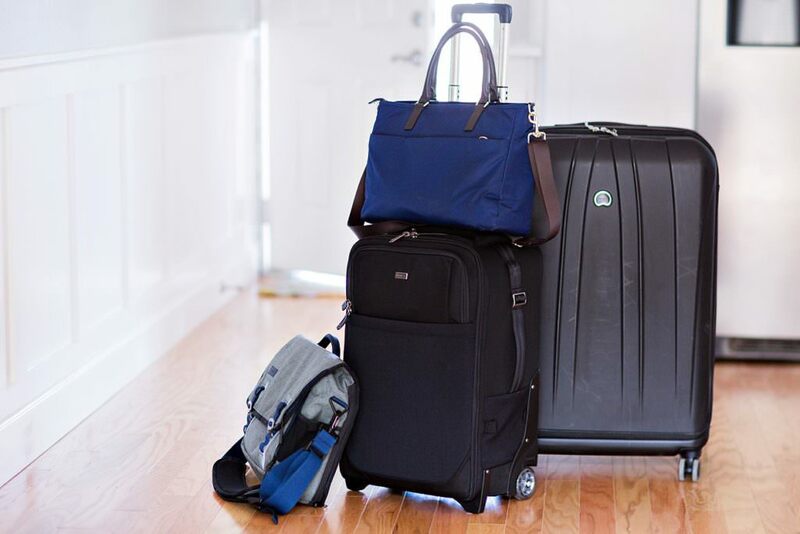 At a minimum, you definitely need to have two - if not three - copies of the wedding when you’re traveling, and then separate the copies amongst your luggage and your bodies in case of theft or loss. This is our favorite setup that we've used for nearly a decade of worldwide traveling with professional wedding photography gear, and we can't recommend it more! Remember - keep it simple and keep it durable! I'd love to hear what travel gear you love to use for your shoots, too. Hop into our FREE photographer only Facebook Group and join the conversation there!